Gardening season is quickly approaching, and as with many things, there are trends that come about. In this article we’ll be looking at the Top 5 Vegetable Garden Designs for 2018. As the price of fresh produce skyrockets, people are becoming more interested in growing their own. With more options now available and acceptable, you no longer need a large plot of land to grow a garden. When planning your garden, no matter the size, keep in mind most vegetables thrive on at least six hours of full sun per day. If you do not have a spot with the minimum, you can supplement it with artificial light. This article concentrates on areas with at least the minimum. If you are fortunate enough to have a small plot of land, then this design is ideal. Row housing usually has a small front yard and backyard, which lends itself to close planting such as this. To make your own small vegetable garden, you have a couple of options. 1: to cultivate the soil in your space and plant a traditional row garden, or 2: build a raised bed in a U shape to utilize every square inch of space you have. I’m guessing you are more interested in utilizing your space to the fullest, which will give you more vegetables for your table. In order to maximize the type of crops you can grow, build a raised bed at least 45 centimetres (18 inches) deep. Materials such as cedar, concrete and even recycled plastics may be used. If you are placing this type close to a fence (as will most likely be the case in row housing), make the bed no more than 60 centimetres (24 inches) wide. This width will ensure you can reach the farthest vegetables (and weeds) without having to step up on the bed. The length will be determined by your available space, but a good number is 3 metres (10 feet). The bottom of your U can be shorter, but keep in mind you will need space to walk along the inside. I suggest leaving at least 60 centimetres (24 inches) between your two long sides. It takes a lot of soil to fill these, so ensure you are getting quality topsoil and aged manure. Since you will be in close proximity to neighbours, you had best not get any fresh manure hauled in. If you do, the “good neighbour award” will NOT be yours. Placing a trellis along the side furthest from the sun will enable you to plant climbing vegetables, such as cucumbers, runner beans, peas and even squash. You will not want to place the trellis on the side closest to the sun, as you will shade your lower crops. Another growing trend for small spaces is container gardening. The size of your containers will dictate what you can grow. A half-whiskey barrel will work well for vegetables that need some underground space, such as potatoes, beets or carrots, while a longer, shallow container will work well for lettuce, radishes and other above ground crops. It’s important to keep in mind containers dry out much quicker than a raised bed or traditional garden plot. In order to conserve moisture and increase humidity, group your containers together and place them on trays of pebbles filled with water. If you find you will need to move your containers around, place the larger ones on heavy-duty castors. Your back will thank you for it if you happen to need to move them for any reason, such as a storm or to protect them from the hot sun. With our spaces becoming smaller due to an ever-increasing population, planting for privacy is on the rise. If your patio or balcony is right next to your neighbour’s, you can plant vegetables such as runner beans, cucumbers, peas and even tomatoes to offer a degree of privacy. If you don’t care for prying eyes, I’m sure they don’t either. Bamboo stakes or lattice make excellent supports for climbing plants while protecting your garden design ideas. Another reason for privacy planting is to obscure the view from the street, especially when the front of the house is mere feet from the sidewalk. Older communities have a lot of houses that fit this description, so adding a living screen between you and the street is favourable. If you have a larger plot of land, planting sunflowers along a low fence will offer more privacy. Planting runner beans with the sunflowers will increase the foliage and edibles, as the beans will climb the sunflower stalks. Plant the beans at least two weeks after the sunflowers have begun to grow, otherwise they will not have the support early enough. 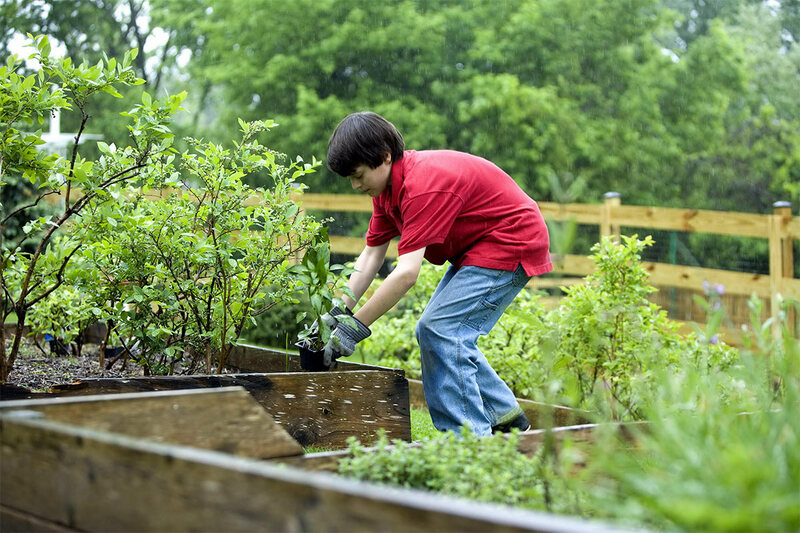 Adding a trellis to raised beds along the property line will increase privacy for both sides, and provide you and your family with fresh vegetables all summer long. The trellis may be left in place to offer winter screening as well. With warmer weather also comes the option of eating meals on patios, balconies and terraces. To be both trendy and practical, planting vegetables in your outdoor dining space will add colour, interest and the ingredients for a salad. You can have a table for two tucked into a corner of your patio, or several tables for a bigger dinner party. Setting potted salad greens on the center of the tables can be a nice addition, and allows your guests to create their very own fresh-from-the-garden salad. That’s not something every house party provides. When choosing alfresco dining, add plants such as citronella and marigolds to repel the bugs that will want to join your party. They all have a place in the garden, but in your salad is not one of them. What was once thought of as a novelty, balcony gardening is on the rise. If your balcony gets at least six hours of sun per day, you can successfully grow flowers and vegetables several stories up. One thing to keep in mind when creating a balcony garden is to adhere to building weight codes. It might seem like a hassle, but finding out weight restrictions before a disaster happens is best. I can’t imagine putting the time and effort into creating a beautiful garden on my tenth floor balcony, only to have it come crashing down – literally. Remember: pots, soil and growing plants are heavy. That’s not to say you can’t have a garden; just stay within the weight limits. It’s better to be safe than sorry. For a balcony that gets a lot of hot sun, you may wish to install a roll away bamboo screen, or plant a heat-tolerant climbing vine to shade the more sensitive plants. The higher the balcony, the windier it may be so take that into consideration as well when choosing your vegetables. And, as much as we find insects annoying at times, they are vital to the pollination of plants. Know your bugs, and just how high is too high for them. Swarms of mosquitoes will be a problem closer to the ground, but your thirtieth floor balcony could be relatively mosquito-free. If you don’t notice mosquitoes, chances are the beneficial insects won’t be getting to your plants either. Check with an entomologist or the bug section in your local library. No matter where in the world you are, being able to plant a garden and be trendy at the same time is possible. Trends will come and go, but the need for a sustainable food source will always be there. As the saying goes, where there’s a will there’s a way. And last but not least, growing your own vegetables is good for you. Nick Dickinson is an award winning landscape designer with forty years of design experience. Nick is renowned for quickly and accurately interpreting a complex brief and then producing elegant, bold schemes that his clients recognise as their own.